The Turkey Dinner is a long-standing tradition in our schools. Held in October, volunteers from both schools come together to set-up, cook, and serve over 2,000 meals to community patrons. With a menu of roast turkey, made-from-scratch dressing, mashed potatoes & gravy, slow-cooked green beans, and an array of home-baked desserts, you can't beat the Turkey Dinner! 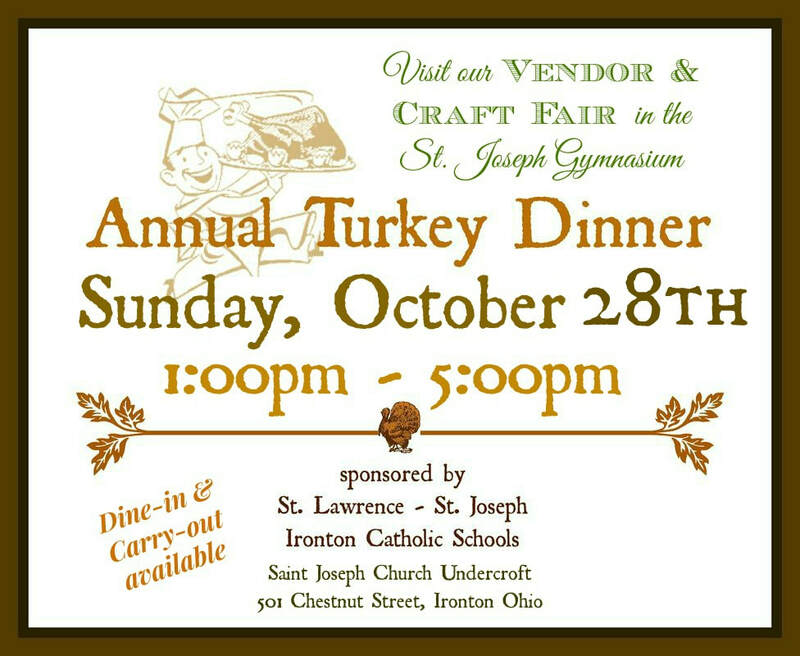 ​We also have a wonderful Craft & Vendor Fair in the St. Joseph High School Gymnasium during the Turkey Dinner. Stroll over after dinner and browse our vendor booths. Past vendors include, Lularoe Clothing, Scentsy, Premier Jewelry, Advocare, Thirty-One, Mary Kay, Origami Owl, Beans & Bugs Embroidery, Appalachian Family Woodworks, Initial Outfitters, Young Living Essential Oils, and many more! If you are a vendor interested in reserving a table, email us or call the office at 740.532.0485.